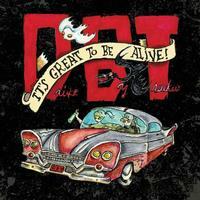 Drive-By Truckers - It's Great To Be Alive! 5LPs and 3CDs, a career-spanning live box set! 5 LPs pressed at Quality Record Pressings together with 3 CDS! An epic, career-spanning live three-night set from the Drive-By Truckers recorded in San Francisco at The Fillmore last fall. As Patterson Hood tells NPR Music: "We sequenced it to be like kind of an ultimate DBT set list. We never use a set list from night to night so the show is ever evolving, but for this it was like, what would be the ultimate three hour show we could play right now?"